During the Ottoman era, people used to summarize faith as "respecting the words of Allah and his creatures;" therefore, they did not overlook animals, while they were helping people in need. According to Islamic culture, people should avoid being unjust to others, and it places animals' rights above human rights since it is possible to compensate for the wrongdoing to people by asking for their forgiveness; however, it is not possible with animals as they lack reason. Prophet Muhammad told the story of two different women who lived long before his time. As he recounted, an evil women went to heaven because she gave water to a dog, while a good woman went to hell because she starved a cat to death. Fearing this story, people in the past fed their animals before they sat down for meals and did not go to bed before they cleaned the animals in their barns and checked if they had water and feed. Moreover, the government punished those who carried barnyard fowls upside down or overloaded horses or donkeys, and people who harmed animals were alienated from their community in the Ottoman Empire. The Ottomans established foundations to feed street dogs and wolves in the mountains, provide water for birds on hot summer days and treat storks with broken wings or injured horses. They also built birdhouses in the courtyards of buildings such as mosques, madrasahs and palaces and placed water pans on gravestones for birds. In the Ottoman archives, it is possible to find records of interesting foundations that reveal people's love and compassion for animals during that time. Müreselli İbrahim Ağa of İzmir donated 100 kuruş annually to the Ödemiş Yeni Mosque for fostering storks around the mosque in 1307. In 1544, Lütfi Pasha granted a fountain, watering hole and pool for travelers and their animals that passed through the district of Tire in İzmir, and in 1558, the governor of Adana, Ramazanoğlu Piri Pasha, donated a meadow for mounts and fatlings to graze on. 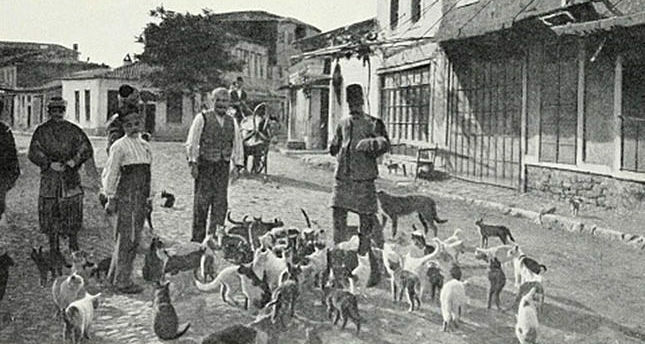 In the certificate-charter of the Hacı Seyyid Mustafa Foundation in Rumelihisarı, it was written, "Stray dogs should be fed with fresh bread worth 30 akçe (silver coins) every day." Furthermore, the Çandarluzade Mehmed Bey Foundation donated a farmhouse for the care of pigeons' in 1707. There is also the Kediler Mosque in Damascus, Syria, which is also a foundation that was established for street kittens. The caretaker of the mosque feeds hundreds of kittens with liver. Also, the area from Marjeh Square to Mezzeh, including the University of Damascus and the Damascus Fair, belongs to a foundation that was established for sheltering mounts that are old or injured. Instead of shooting them or leaving them for dead, their owners leave the animals here for professional care. Located in Istanbul's Beyazıt district, the Istanbul National Library used to be called the "Cat Library," as its former manager, İsmail Saib Sencer, took care of hundreds of street cats in the 20th century. There have always been people who cared for and fed hundreds of cats, especially those individuals who do not have children or do not get enough attention from them instead channel their compassion and love to these animals in need. During the Ottoman period, every house in cities featured a small garden and a poultry house. Cats were an indispensable part of the old wooden houses, which were filled with rats, and they were like the children of the houses, mostly envied. Storks, pigeons, sparrows and swallows could build their nest on the roof of any house without fear as well. Although they are birds whose meat can be eaten, no one ever considered hunting them. The Stork Hospital in the province of Bursa, which was also known as the "Gurabahâne-i Laklakan" (House for Injured Storks), was established for storks whose wings were broken. The building, which is still standing, was also featured in many historical stories. When the storks were cared for and cured, they were then set free. You can see plate-shaped stones that were placed in front of some old houses to feed street animals. The leftover food and bones are left on these stones for street dogs and cats. As dogs share these foods, they do not fight in the streets. Although old Istanbul's street dogs were very famous, the municipality collected all of them in 1909, ferried them to an island in the Marmara Sea and abandoned them. They were left with no food or clean water, and their cries were heard throughout the city. The people who pitied them threw them food, but when all of these dogs died on the island, the residents of the city were disturbed by the smell of their corpses. The wars that broke out and the defeats of the empire following this incident were seen as a punishment for what was done to those animals.